and until now, were the only real way to truly engage a student’s musical faculties. 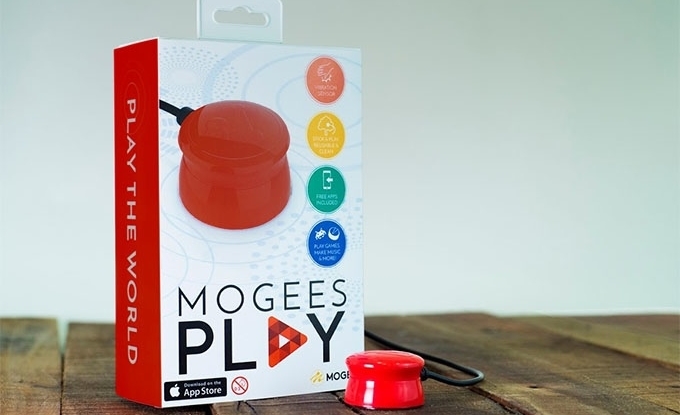 In creating the Mogees Play, UK-based music and technology company Mogees is aiming to bring musical instruction to everyday classrooms and life without needing instruments, controllers, joysticks, or keyboards. How? A small sensor serves as the connection between tablets or smartphones and any object at all — a wall, a book, a table, even another person. Depending on how a user interacts with that object — a bump, a tap, a scratch — Mogees Play reads those vibrations and transforms them into different musical effects. This interface is the foundation of three, educationally-minded apps designed to teach the fundamentals of music. The Pulse app is an addictive rhythm game that teaches the basics of rhythm, timbre, and velocity. Jam is a music creation tool, while Keys (iOS only) allows users to create melodies, arpeggios, and chords. $65 gets backers a Mogees Play by September 2016 should its Kickstarter campaign raise about $53,000 by August 5th, 2016. 2016 has certainly been the year of alternative musical instruments, many of them straddling the line between analog and digital technology. The Mogees Play is a great example of this, blurring the line between physical objects and the technology that adds versatility to the platform, perfect with its open API and educationally-designed setup. Other experimental musical experiences include the motion-based Point Motion, the exercise-centered Motion to Music, and the Remidi T8 MIDI glove.